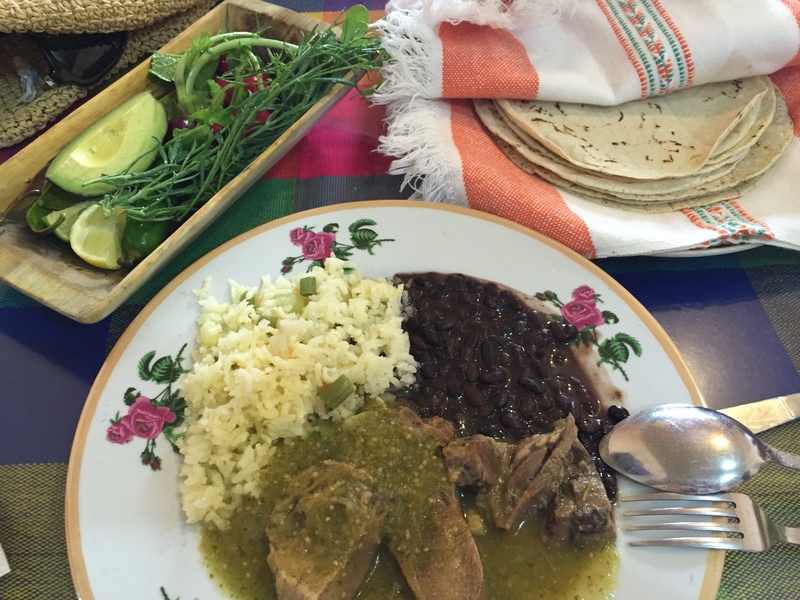 Sunday Fun Day: Tlacolula and El Tule | Dream! Go! Live! Posted on June 16, 2015	by dream!go!live! Oh boy, am I really behind… Since my month-long trip to Mexico in April I went to California, Hawaii, Japan, and Singapore and now I’m in New York having a busy week catching up with friends. 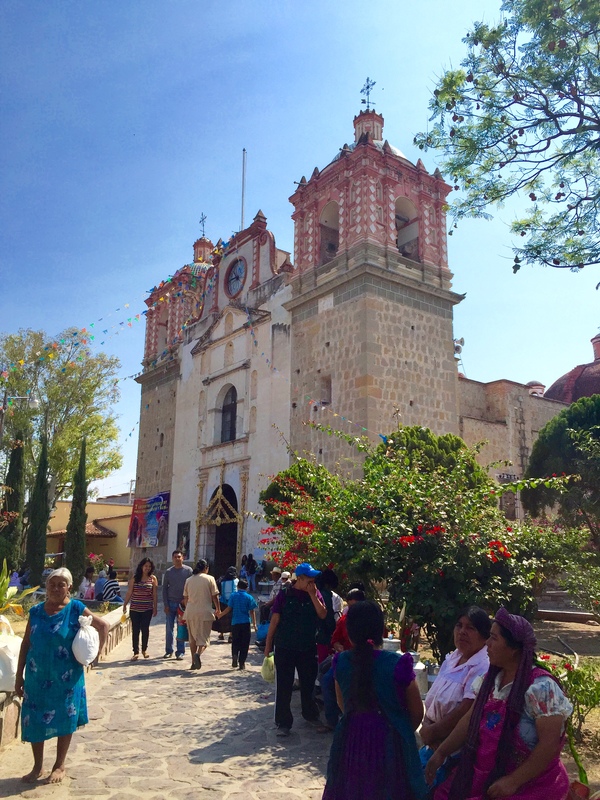 I really want to journalize my visit to Oaxaca and sort through my photos, so I will go back in time now and try my best. Here we go. 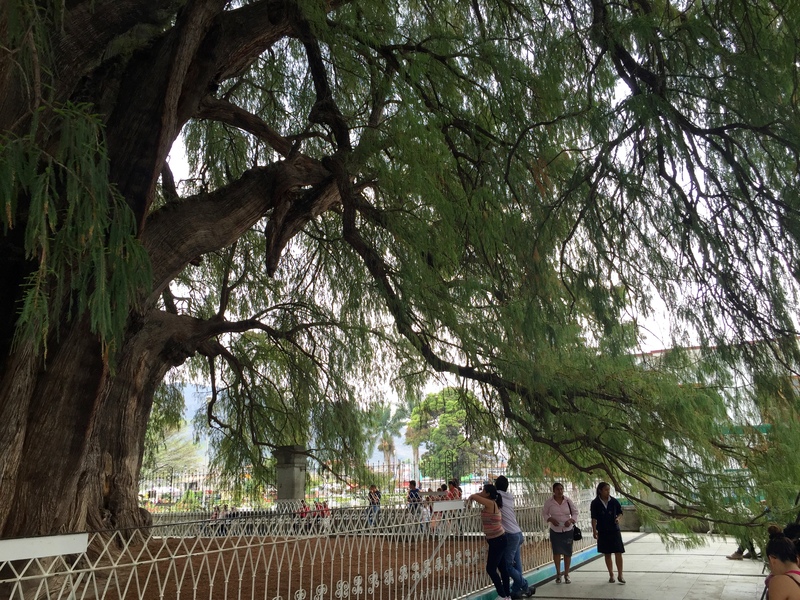 By the end of my third day in Oaxaca it became obvious that I was the only person who hadn’t seen or even heard of THE TREE. At school, my classmates shook their heads and laughed when I asked “what is this tree? it’s a tree?” I guess that’s what I get for not doing any research before coming down here. 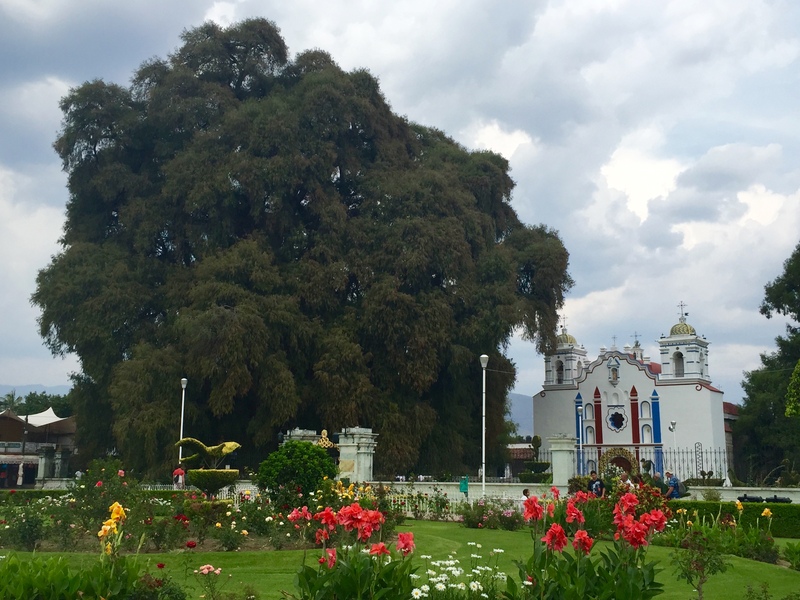 But I learned quickly enough that this tree in Tule must be visited and since I was heading out east, I decided to add a stop to my outing. 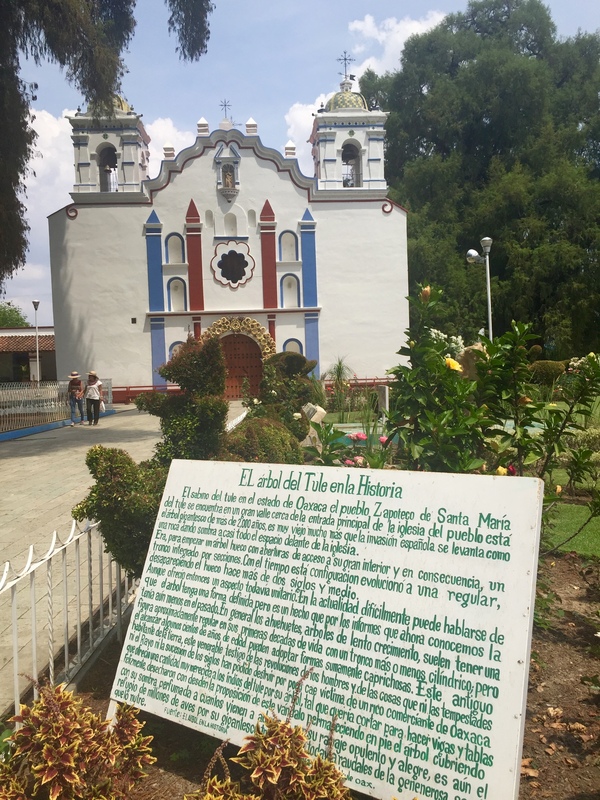 My primary destination for the day was the town of Tlacolula where each Sunday all the people in and around the village hold their tiangui, an open air market. 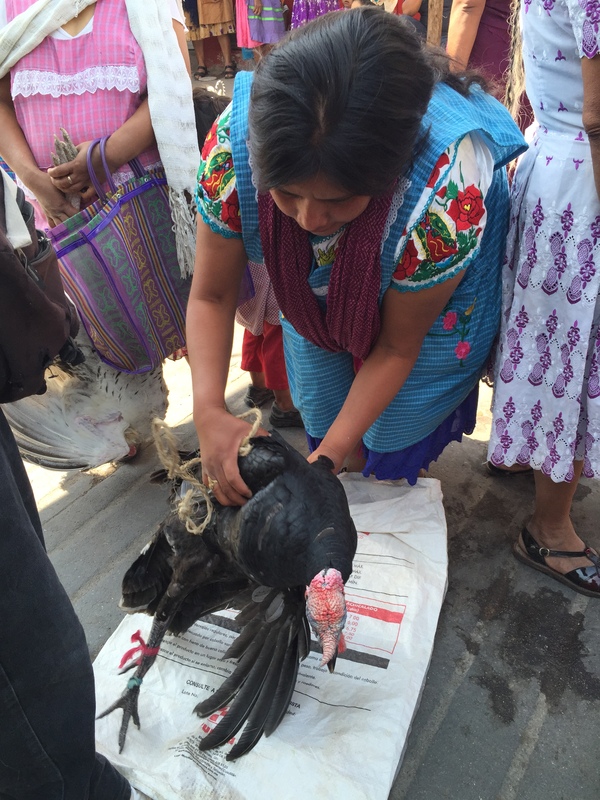 There are tianguis in different villages on different days of the week. 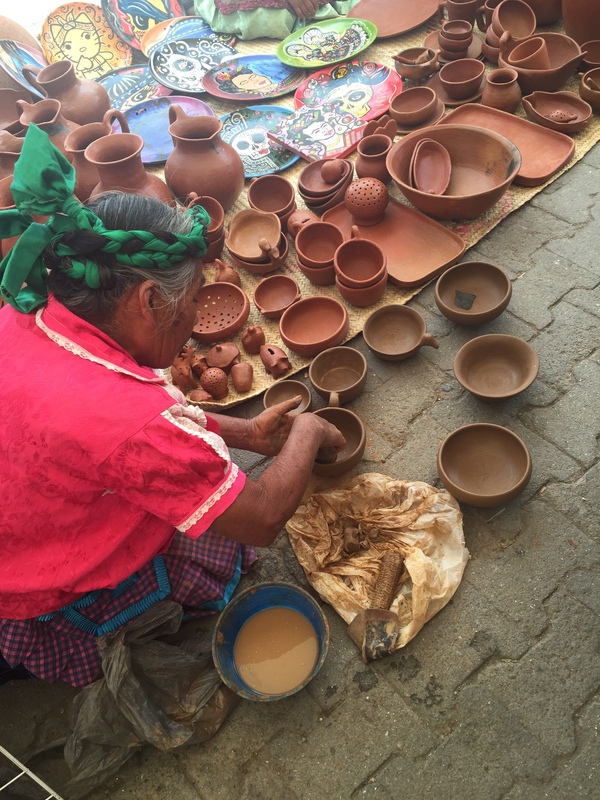 For example, San Pablo Etla has their market day on Wednesdays, Zaachila on Thursdays, Ocotlán, San Bartolo Coyotepec, and in the city of Oaxaca in Llano park there is a weekly Friday tiangui. 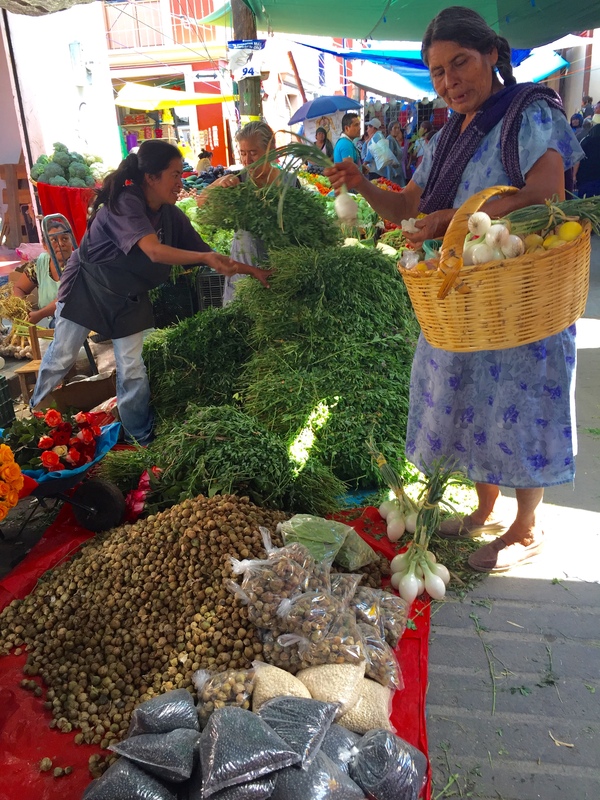 I’ve been to my share of open air markets in many parts of the world so I thought I had a general idea of what I would see in Tlacolula, but what I saw and experienced there was so much better than I could have imagined. 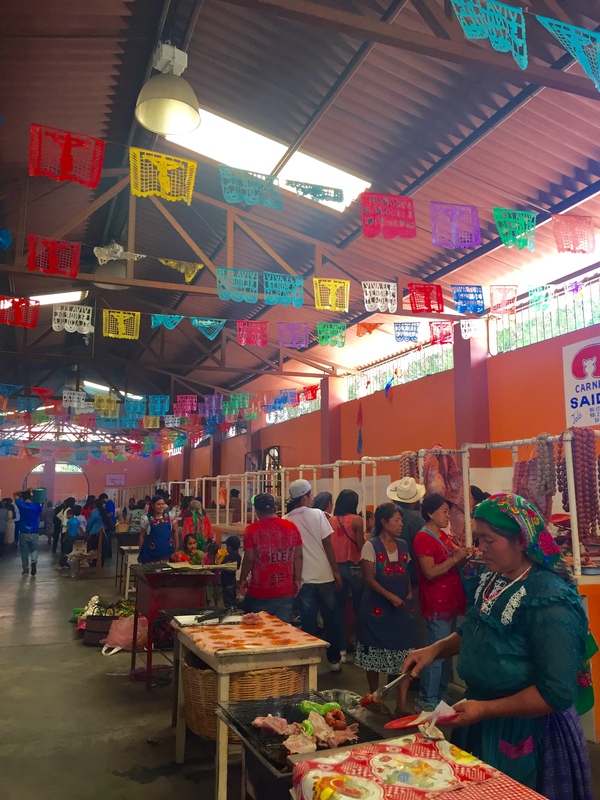 The colors, the smells, the sheer size and the vast number of vendors at the market were absolutely fantastic. 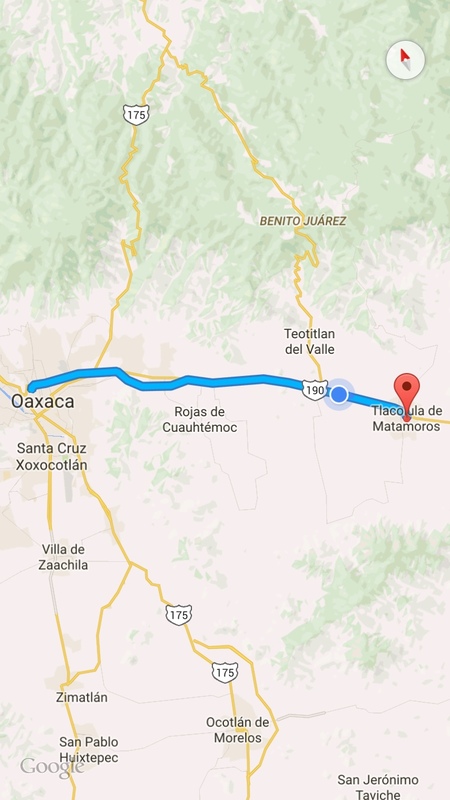 I knew it was going to be a hot day so I tried to leave relatively early, aiming to arrive in Tlacolula by 10:30. I caught a taxi colectivo on the corner by the baseball stadium and we took to the road headed directly east of the city. 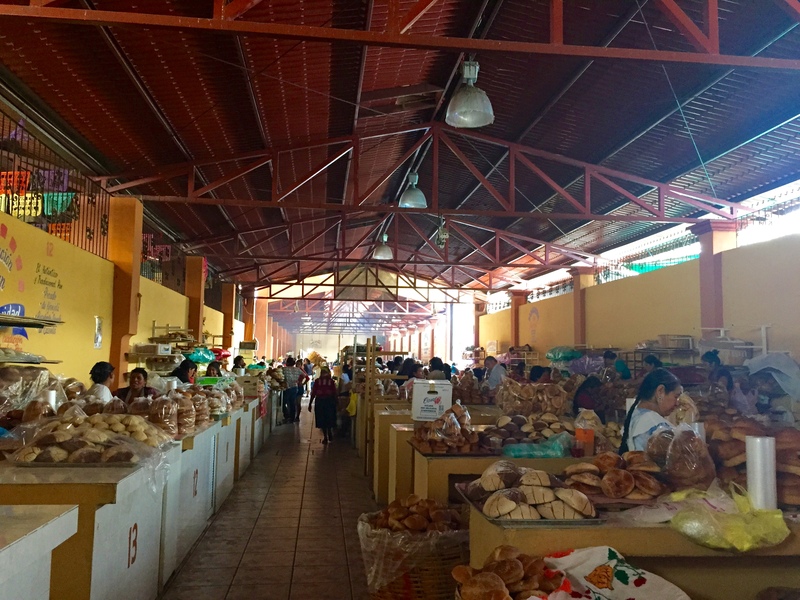 The taxi colectivo dropped me off right in front of the market so I didn’t have to wander around (not that I would have, given how large the market was). Some vendors were still setting up and there weren’t a lot of people there yet. 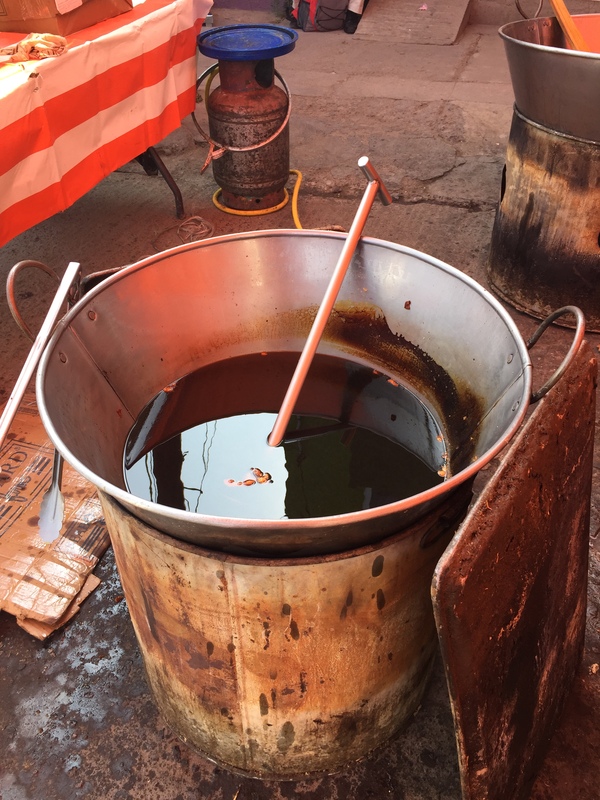 The first thing I saw were these large pieces of chicharones being fried up in large vats of oil. 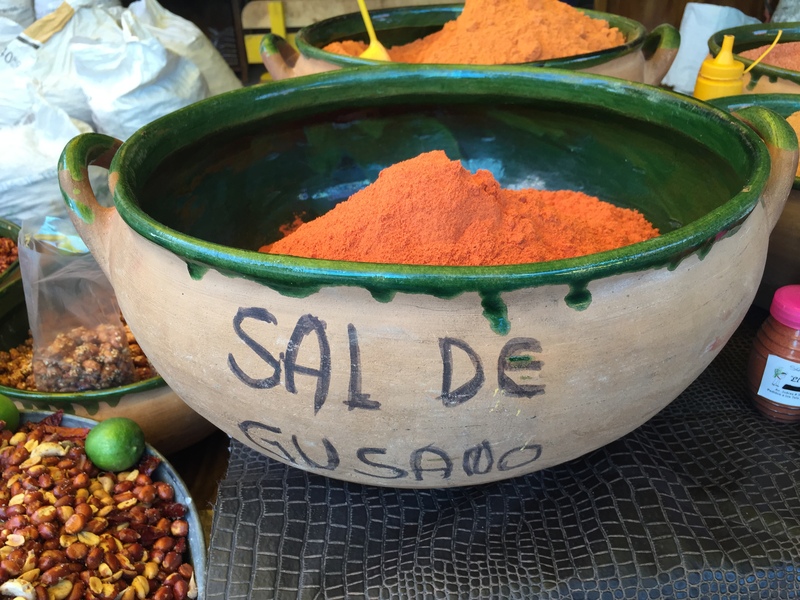 Sal de Gusano (spicy sea salt with toasted and ground agave worms) typically served with an orange wedge for mezcal. 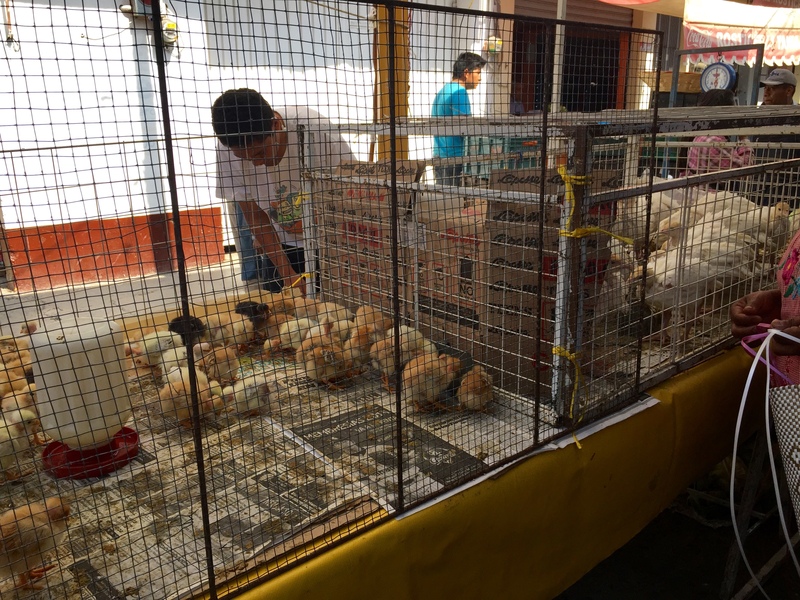 Chicks and chickens for sale. 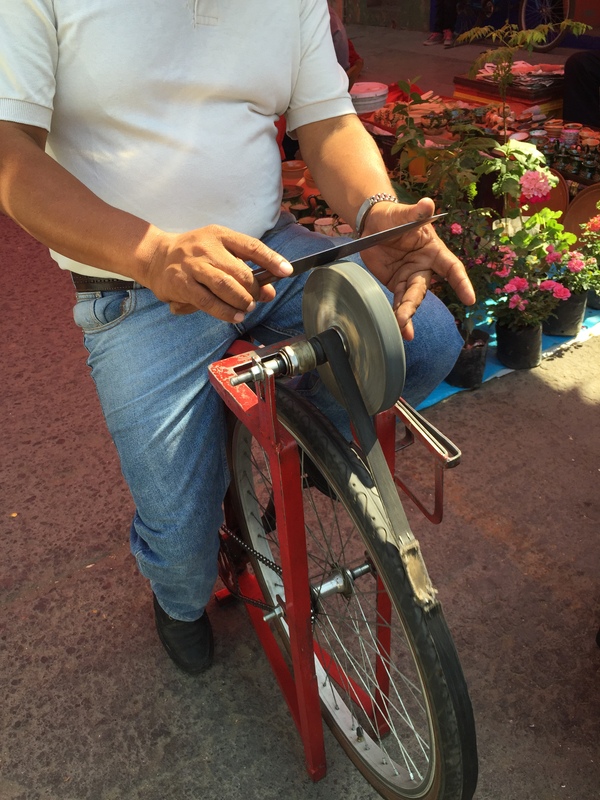 Knife sharpening service. He was very happy to get the wheels going for me to take my photo. 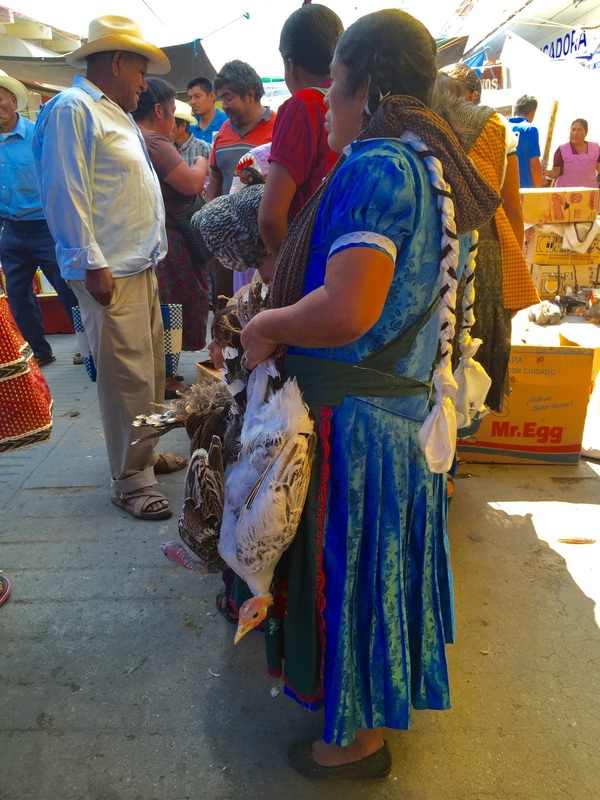 Lots of ladies from nearby indigenous villages in town to sell their products and shop for what they need. 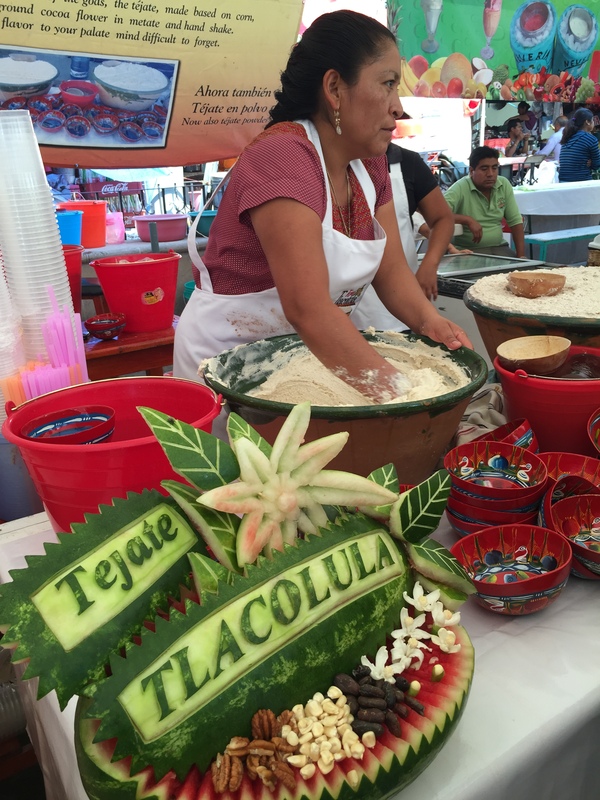 Tejate, a pre-Hispanic drink popular in Oaxaca, is made with toasted corn, nuts, cacao, cinnamon, mamey flowers and seeds (see the ingredients on the watermelon in the photo), and served in painted gourd bowls (the bright red bowls in the photo below). 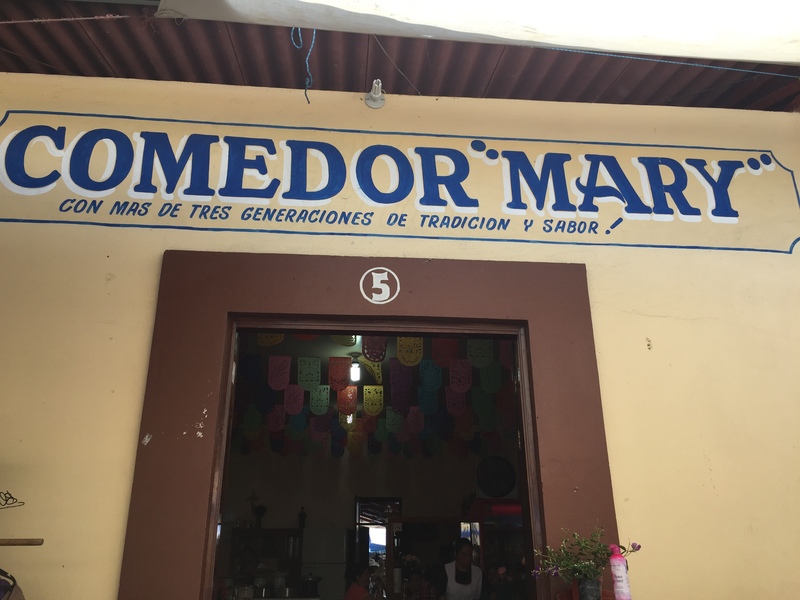 All the ingredients are carefully toasted, ground into a paste using a metate, and mixed by hand with water and ice until it’s foamy and liquid. 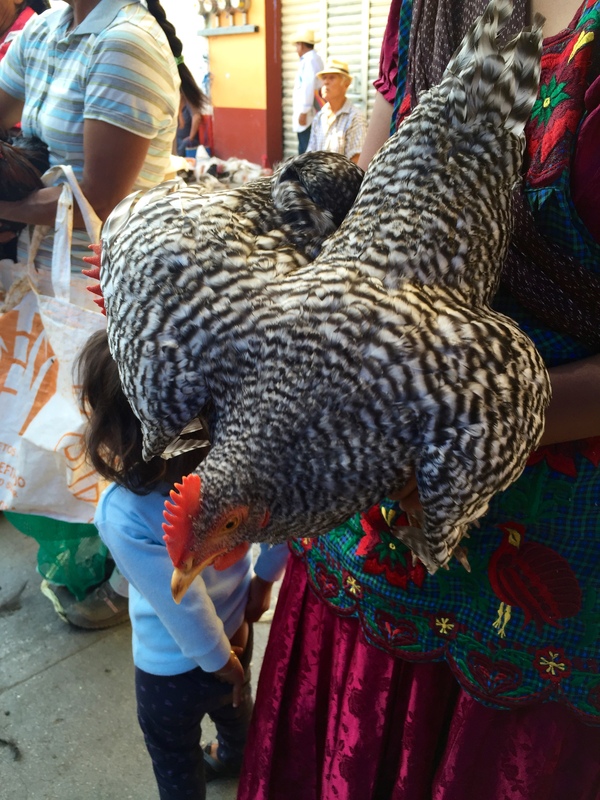 There was a line of these ladies with live chickens and turkeys for sale. 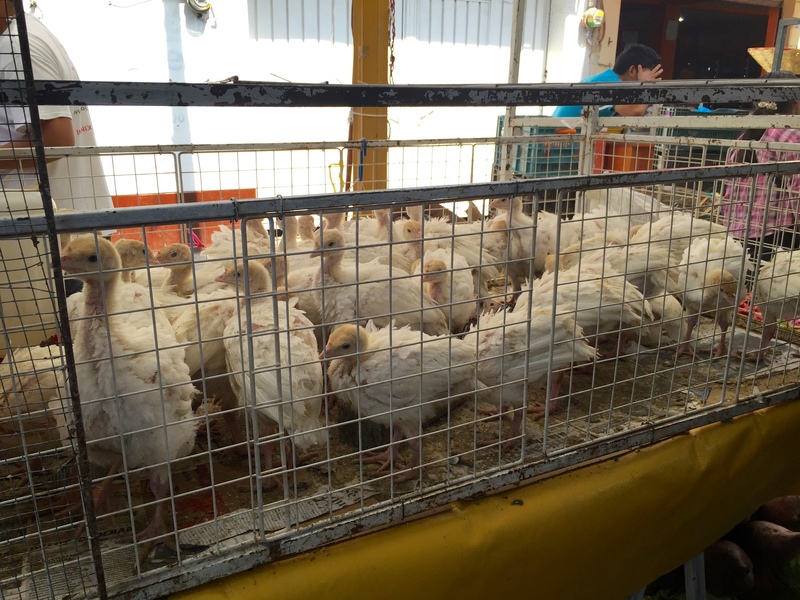 When I returned about an hour later, most of them were sold. 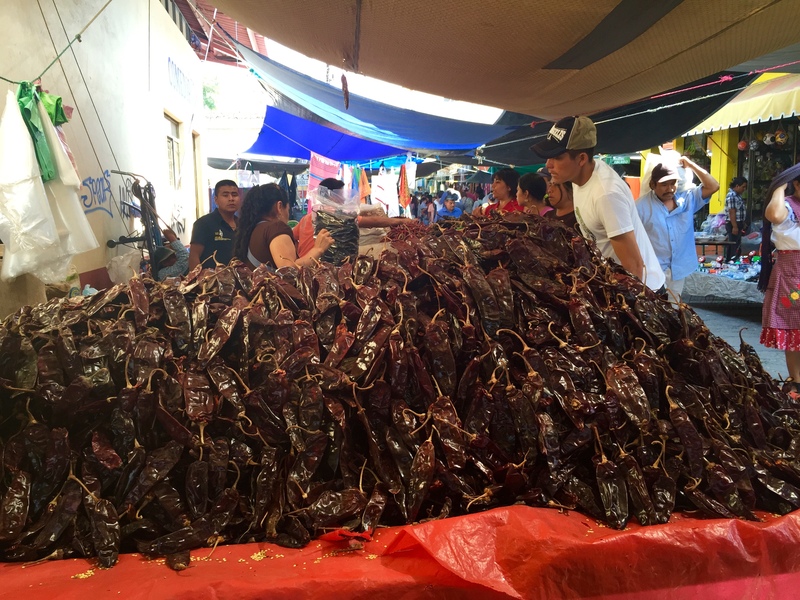 A mountain of chili peppers… also all sold in a few hours. 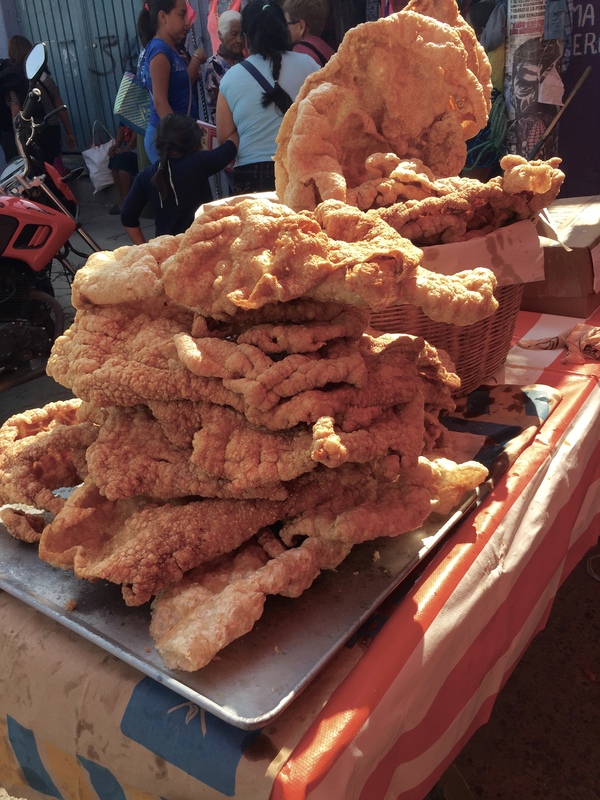 There were plenty of yummy eats to choose from at the market. This squash blossom and quesillo combination is always hard for me to pass up. 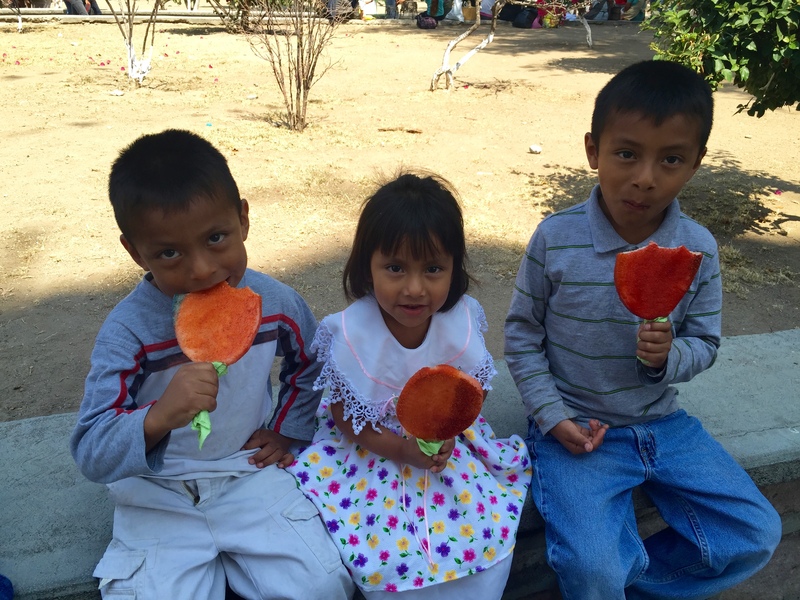 These three siblings are happily munching on giant lollipops made of jicama, covered in lime juice and chili powder. 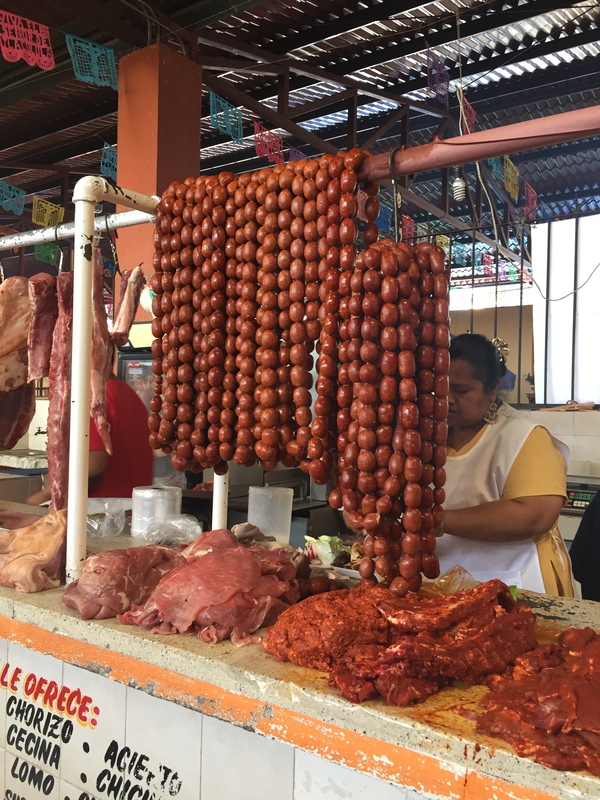 When I asked their mother about the spiciness of what they were snacking on, she looked at me as if I was crazy for asking such a question. 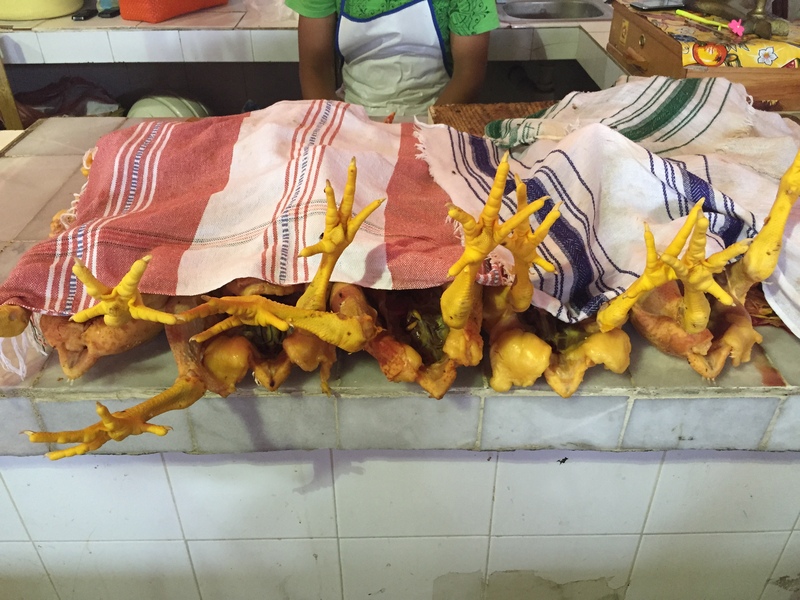 She shook her head emphatically and said “of course it’s not too spicy for them!” then offered to buy me one. 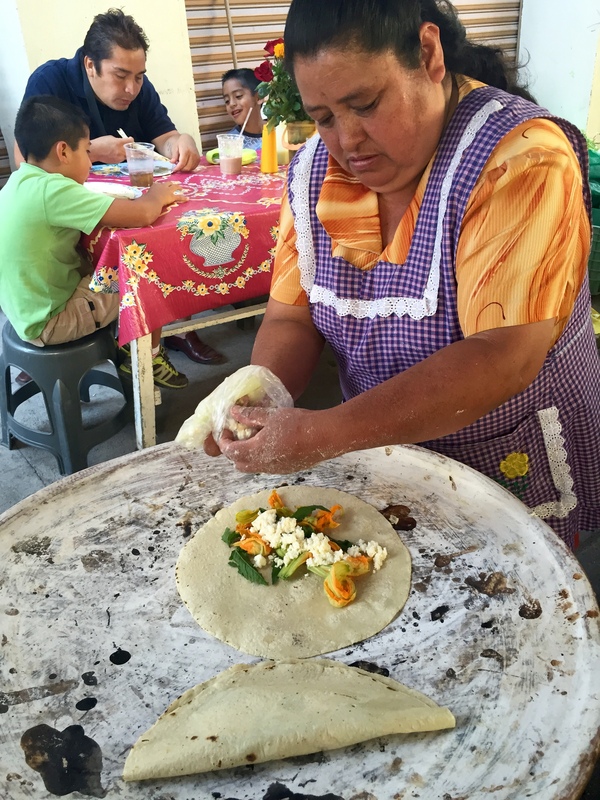 I love Mexican kindness! Along with the open air stalls and vendors, there were large covered areas as well. This one was all about bread. 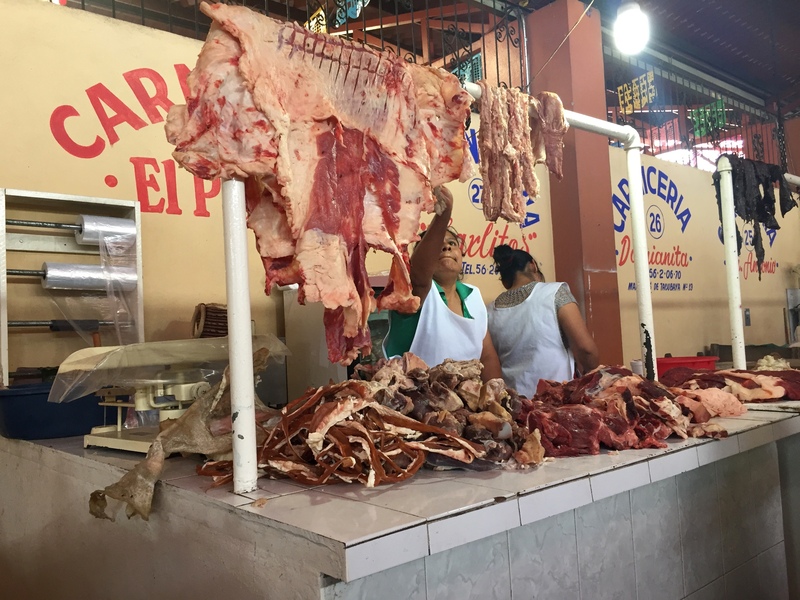 In this section, you can buy whatever cut of meat you want and grill it to your liking in front of the stall where hot coal and grills were available. 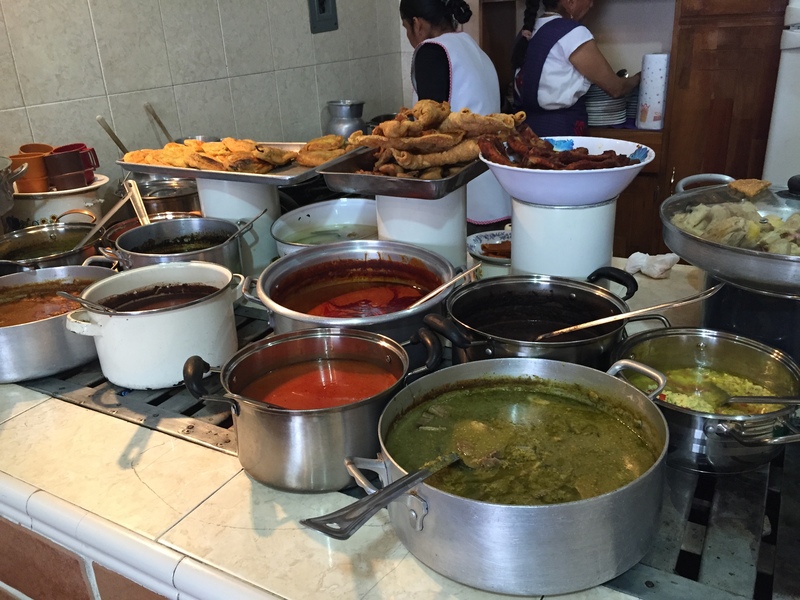 You would buy some green onions, peppers, tortillas, salsa, etc to make your bbq lunch right then and there. As for my lunch, I opted to find myself a home-cooked meal indoors, with proper tables and chairs. 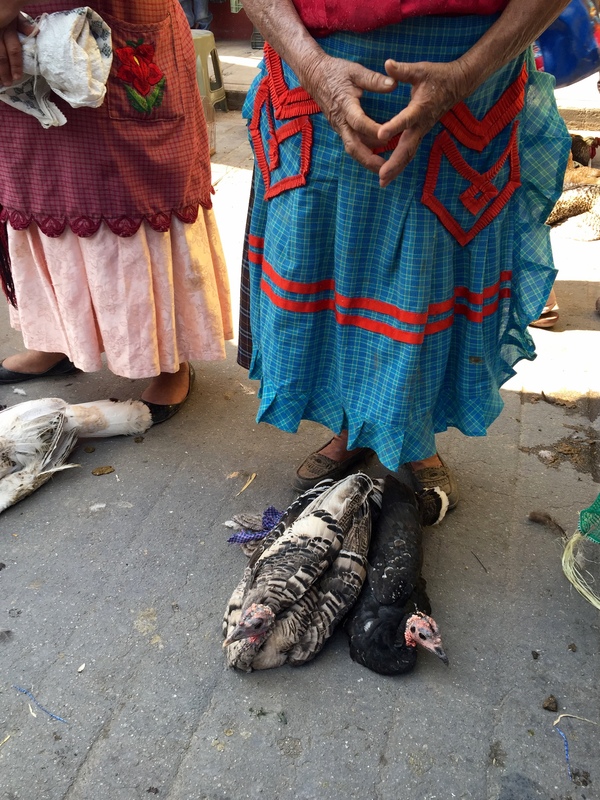 I ended up having a delicious stew and met a couple of local Oaxacans with whom I share a table. I didn’t know which sauce was what and which stew had what meat. I chose the green stew in front and it was delicious. 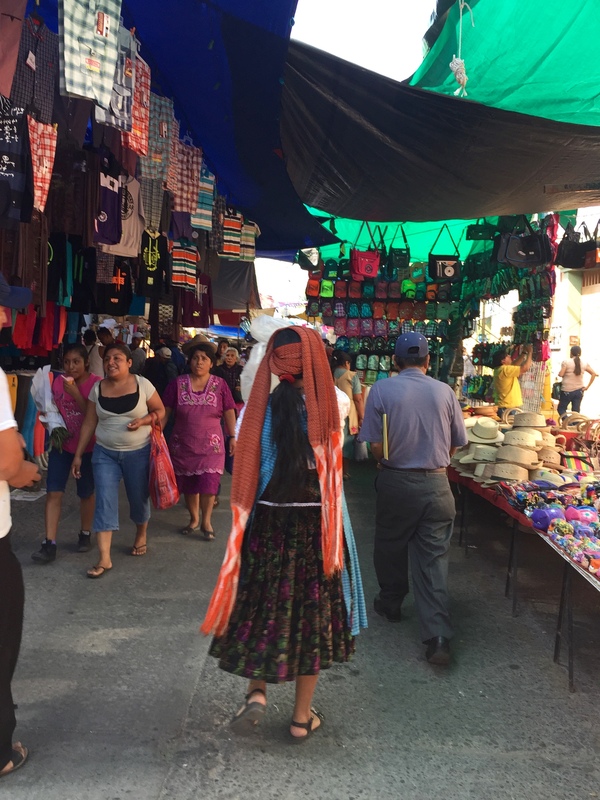 After I walked back and forth a few times and poked around in all the nooks and crannies of the market, I got myself back in a taxi colectivo going to Oaxaca. 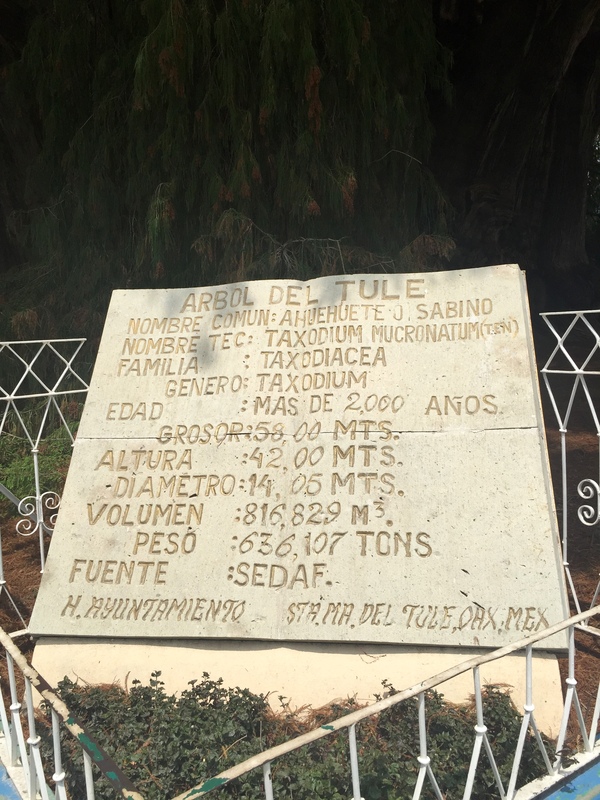 I asked the driver to drop me off in Tule so that I could finally see The Tree. There was a small fee to get in (I don’t know, the tree is so huge that you could easily just look at it from the plaza) and you could also pay a small fee to have a short guided tour by little kids who pointed out various animals figures you can make out in the formation of the tree. 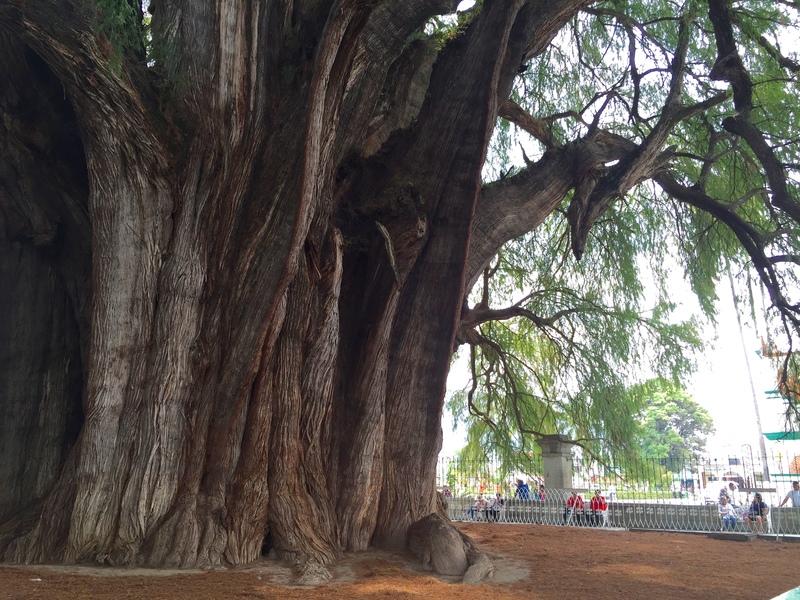 Here you have it, a gigantic tree that’s more than 2,000 years old.. I took a break from the hot day sitting with some of the local residents taking refuge in the cool shade cast by the tree. With a bit of distance and the church building next to it, I could really see how large this tree is. It was a nice way to cap off a day of fun in Oaxaca. I hope you will continue to grow and flourish! 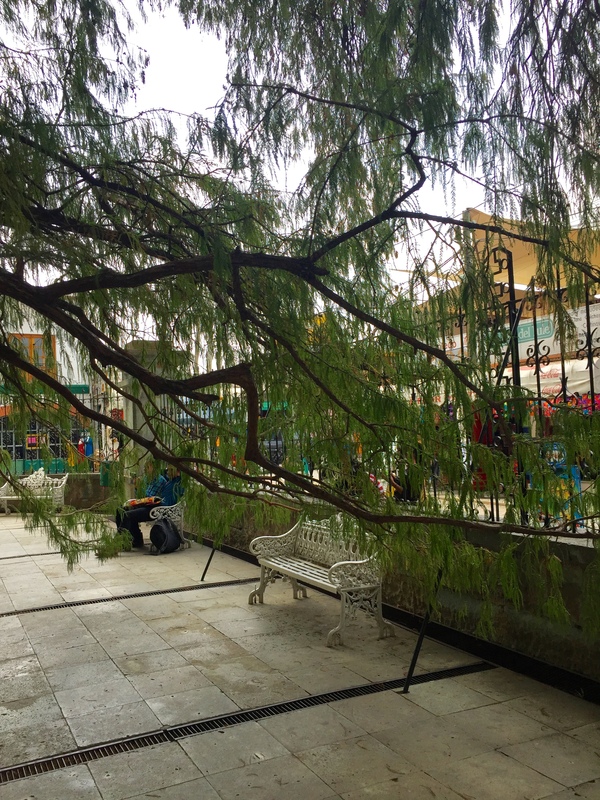 This entry was posted in 2015, Spain, Travel and tagged Árbol del Tule, Colectivos, El Tule, Famous Tree, Free Things to Do in Oaxaca, Market Day, Mercados, Mexico, Oaxaca, Santa María del Tule, Solo Travel, The Tule Tree, Things to Do in Oaxaca, Tianguis, Tlacolula, Tlacolula de Matamoros, Transportation in Oaxaca. Bookmark the permalink.